From sandhills to farm fields, three major railroads travel through the vast countryside of western Nebraska. Take a ride in the cab with the Chicago & North Western as it transfers bentonite clay to the Burlington Northern in Crawford. Burlington Northern coal trains tackle the 2.2% grade of Crawford Hill with helper units. The C&NW also moves coal out of Wyoming on the recently constructed line to South Morrill. From there, the Union Pacific then takes the coal eastward. U.P. then shows off its high-speed movement on the Transcontinental Main Line. From the Land of Infinite Variety comes railroading of all varieties! Tourist steam trains, short lines and main lines make western South Dakota a "hot spot" for all railfans! 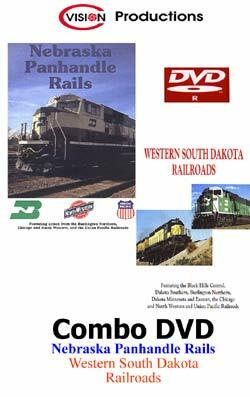 View such railroads as the Black Hills Central, Dakota Southern, Burlington Northern, Dakota Minnesota & Eastern, Chicago & North Western, and Union Pacific. Click here for the full description. Combo videos are always videos that are of a little extra interest. 2 different areas, yet close in nature. The video is no different. In part #1, C-Vision heads for the Crawford Hills region of Nebraska, where 3 different lines are shown. The C&NW, UP and BN are all featured. This is one of the finest videos that I have seen of this region. There are multiple locations showing the long trains and helper units, even with a set on the lead of a train. Filmed in 1994, the BN cascade green is dominate, along with the original colours of the other noted lines. Part #2 is on to South Dakota, where we see several lines in operation. Starting with a tourist line, there is also shortline and mainline operations of the UP, BN, DM&E, and Dakota Southern. A wide variety of the regions rail operations. Like all C-Vision videos, narration is limited to the that of what is been seen at the time, and the natural sounds of the outdoors and the trains are well heard. There is some history of the region as well to be heard and seen in this video presentation. A great video that I am sure all rail fans will truly enjoy.